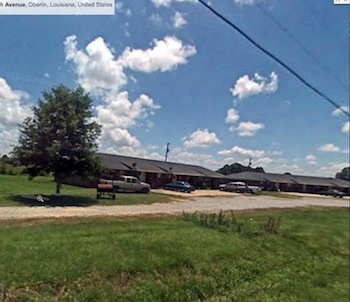 After reading the contact form notification, Google was used to verify the address and get a look at the nursing home. Kevin even said to call the home and gave the phone number. At first I thought Kevin was an employee, but after actually speaking realized he was one of the residents at St. Francis. HI, MY NAME IS KEVIN G. I AM LIVING IN A NURSE HOME. CALL ST FRANCES.ADDRESS 417 INDUSTRIAL DR OBERLIN LA 70655.I AM ASKING YOULL FOR HELP PLEASE. LIKE A DONATION OF ONE BIRD BATH. PLEASE.THIS WILL MAKE THESE OLD PEOPLE HERE VERY HAPPY. Look at the image, it’s called a nursing home, how sad is that? I’d imagine residents have little to no family, and the ones who do-likely don’t see them too often. A friend had started a program a while back called “birds for brains”. It was a wonderful (but short-lived I think) endeavor where a we, and a few other retailers donated bird feeders, and local feed & seed stores donated seed. 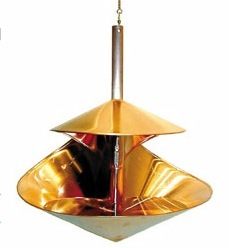 The neighboring boy scout troops maintained these feeders at several nursing homes. The interaction among residents just watching the birds was delightful. It gave them something engaging to do and brought smiles to their faces. Back in the day, kevin likely had his own yard filled with sweet birds. We’ll definitely oblige and send along a hanging bird bath for Kevin and the other residents… and for the birds. A feeder probably wouldn’t do much good as funds are limited for this group of old souls and seed costs money. At least water’s free and it is a great way to entice some feathered friends. And by chance if anyone in the birding industry happens to catch this post, please consider something to entice wild birds for the residents of St. Francis, even a bench or chairs to sit outside and watch them. The guy’s for real, as is the address above and the place. Especially with Thanksgiving upon us, how can you not be thankful for what you have by giving to others? 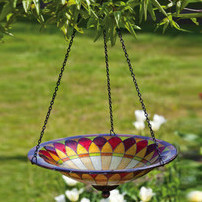 Even the smallest yard can yield colorful wild bird activity… and without ever filling a feeder. Water is the simplest way to attract birds, and moving water really grabs their attention! A simple plant saucer filled with water will see lots of activity, provided the water stays fresh. For the deck, patio or apartment balcony, various brackets and hooks will accommodate hanging baths or feeders. 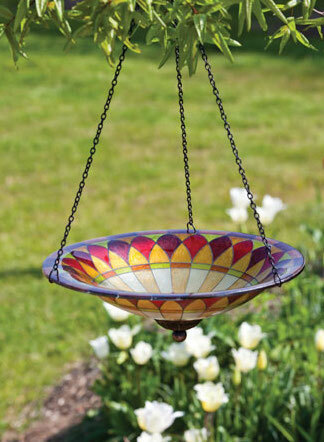 This solar hanging bird bath is the perfect option for enticing feathered friends to just about any space. The only caveat is the fountain must be in full sun for the panel to operate. Since there are no cords or wires, energy is not stored – but real time so to speak. Not only song birds, but butterflies and hummingbirds also adore moving water, and are drawn to it like a magnet. If you’re new the backyard birding thing… think water! Any shallow pan or bowl will do, but not too deep. 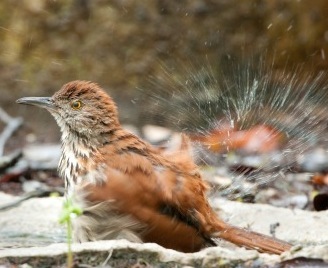 An optimal depth for birds to bathe and wade comfortably is about two to three inches. If the water is any deeper, consider placing a large rock in the center for birds to land and perch. Texture helps too, as birds are able to get better footing on something that’s not too slick. Just keep the water fresh and watch… because if you build it they will come! 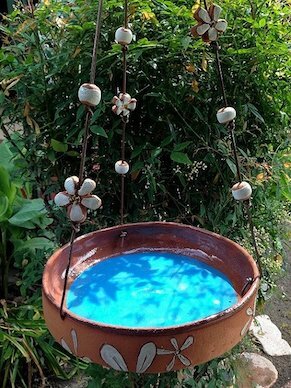 Make Birds’ Holidays Happy with a Solar Hanging Bird Bath! Want to find that really special gift for the nature fanatic on your list? 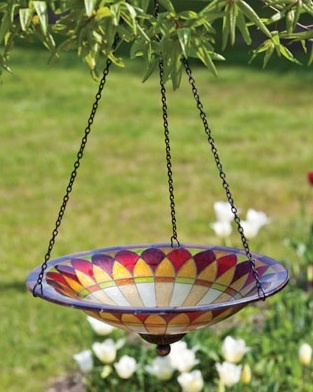 Look no further than this solar hanging bird bath. Because fresh water in the landscape is the best way to attract birds, if that water happens to move it’s even better! Like a visual magnet, birds are drawn to moving water, even the ones who may not visit feeders, or use nest boxes. Baths are relatively easy to care for, and don’t cost money to fill like feeders. They’re great for small spaces, even on the deck, patio, or porch. There’s lots of installation options too, with innovative deck brackets, hooks and hangers. 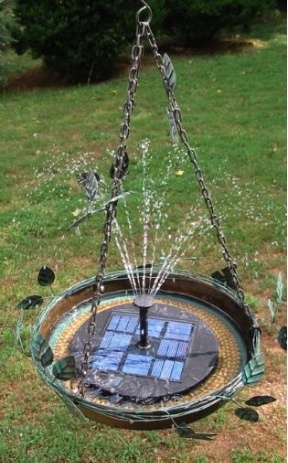 The no-rust, copper bronze finish is nice, and this hanging bird bath is plenty deep enough to accommodate a heater in winter. For something a little more artsy, there’s a killer handcrafted, weatherproof stoneware hanging bath. In vibrant tangerine or raspberry blue, it’s sure to punch up any spot in the garden. 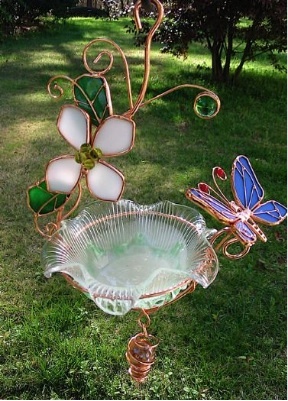 And if you think bird baths need to be large to lure birds… think again! This past summer we had birds actually drinking from ant moats – despite the nine birdbaths scattered around the yard! 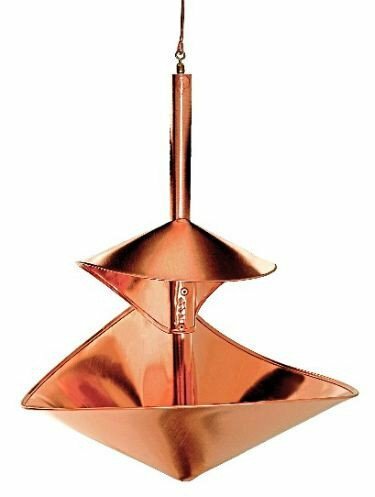 For a very economical (so practical yet still attractive) choice, check out this stained glass & copper mini-hanging bath/feeder. It comes in six fun designs, and the pretty glass dish is perfect for offering a variety of treats; from seed mixes, suet and nuggets, to peanuts, and fruit in summer, even mealworms if one’s so inclined! 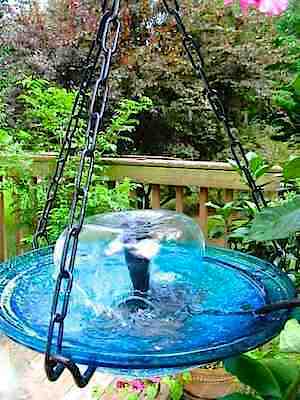 And of course plain old fresh water will absolutely entice feathered friends! This one’s already on sale, and with the super secret, special holiday promo code, you can nab an additional 10% off. So if you’re still stumped for a perfect birding gift… jot down promo code MC10 and head over to our hanging bird bath section! 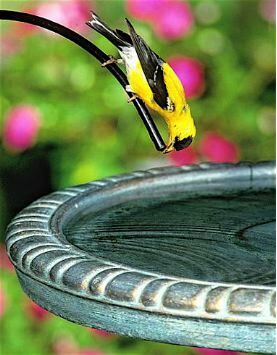 Fresh water attracts more birds… more so than feeders or birdhouses! 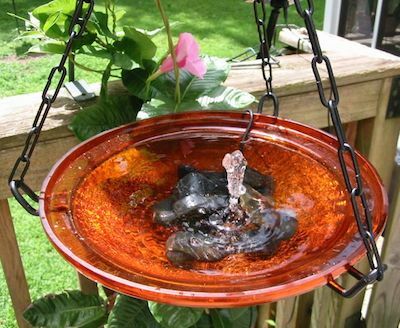 A hanging bird bath is perfect for small spaces, decks and porches, and especially if ground predators should be lurking in your yard. 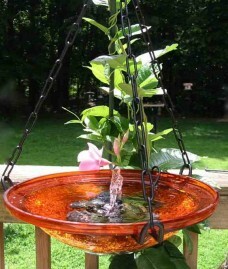 This unique bird bath, features a multi level walk-in design which birds find quite enticing. The rough texture provides perfect footing, while the decorative chain creates lots of perching spots. 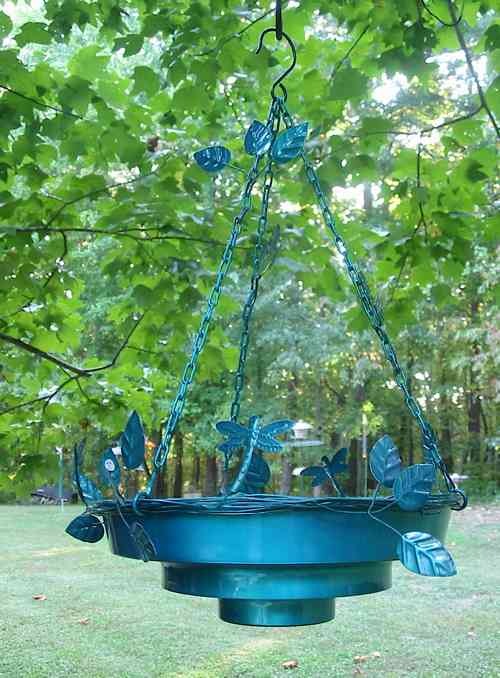 In care free rust-proof aluminum, the stunning electric blue hue of this hanging bird bath has some other great features too! It’s innovative design will allow you to create a simple water feature to add moving water to your bath. A Water Wiggler, Birdbath dripper, or leaf mister can easily be used with this cool bath. In addition, a bath heater may be installed for frigid weather. 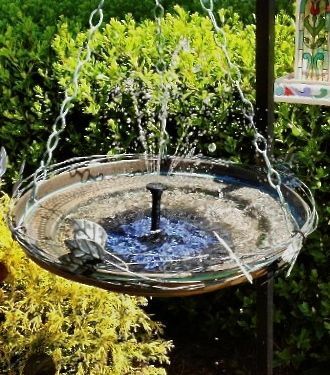 If fresh water in a bath attracts more birds… imagine what moving water in this hanging bird bath will do for your feathered friends – and a better bird watching experience for you as well!